In regards to the trucking industry, we often only think about those who traverse the roads in the United States versus those who truck overseas. Those who drive in Europe have similar experiences to those who hold cdl jobs in United States, managing life on the road and sharing experiences of a mobile lifestyle. Drivers in North America and Europe both understand the potential pitfalls that come with trucking and the benefits a life on the road can provide for an individual. Where the divide occurs, however, is the conditions and wages that American drivers see versus what many European drivers are offered. For instance, the average work week for drivers in Europe can be anywhere from a minimum of 48 hours to over 60 hours, a limit that is often exceeded. Compared to the United States where drivers cannot exceed more than 60 hours in seven consecutive days, this provides for a potentially grueling work week for European drivers. A great deal of drivers come from Macedonia, Ukraine, Romania, Belarus, and other European nations to keep the industry of commerce flowing smoothly across the continent. Regarding the average salary in both countries, European drivers make significantly less than drivers in the United States. Whereas European drivers make somewhere in the neighborhood of $30,000, drivers in the United States see at least an increase in salary of at least 30%, with room for higher figures depending on one’s route and type of freight. Sources in Europe report that wages are unlikely to increase in the near future. In The United States, a long haul driver out for 6 weeks is a substantial amount of time – in Europe, that only begins to define “long haul.” Many distance drivers overseas can be out for months on end without seeing home time, endlessly working around to clock to ensure their freight is delivered. Many fleets in Europe have small cabs, making the fleets in the United States seem palatial. 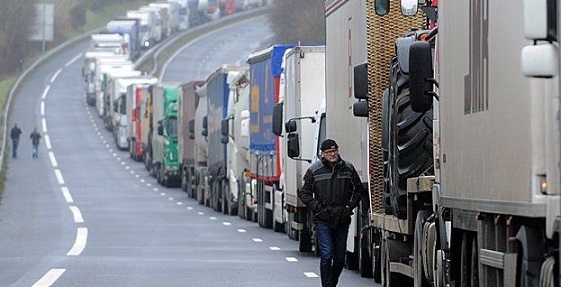 Given these conditions for European drivers, many wonder why they might seek out the occupation at all. One reason that so many seek out trucking jobs is because they provide steady careers in the wake of a great deal of unemployment in one’s home country. Many drivers in Europe also use driving as a means of personal freedom. Just as United States drivers can find some solace in a nomadic lifestyle, some drivers in Europe are using trucking to escaping the awful conditions of their country or an oppressive government. Of course, it’s not all doom and gloom for our drivers around Europe. Many truckers truly enjoy the lifestyle that commercial driving can bring and use the extended period of time in their cabs to their benefit. With the extended long hauls come the opportunity to see parts of Europe previously unexplored and to experience different cultures.